* Mariell's 1 5/8" h pearl drop vintage wedding earrings have soft creme oblong pearl teardrops. * Our rhodium French wire earrings with Cubic Zirconia pave & retro beadcaps are top sellers for bridal, bridesmaids or mothers of the brides at a great price! * These stunning vintage wedding earrings by Mariell have a unique oblong pearl teardrops. 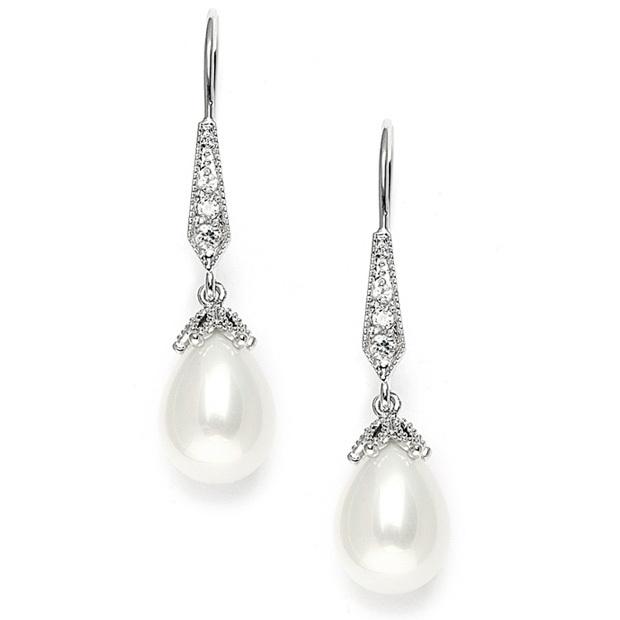 * The beautiful lustrous pealrs drops have the look of genuine Majorca pearls. * The vintage silver rhodium French wire tops have delicate antique pave with a retro style bead cap on the pearls. * These wholesale drop earrings are top sellers for bridal, bridesmaids or mothers of the brides at an irresistible price!